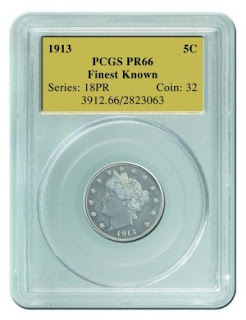 The Olsen-Hall 1913 nickel, that once was owned by King Farouk, sold yesterday for $3.737 million. It was graded PR 64. The finest known 1913 nickel sold for over $5 million. It was grade PR66, and was known as the Eliasberg Specimen. King Farouk liked to fondle his coins, so the grade on the coin he owned was just a little less. It was a Proof 64. It's now known as the Olsen-Hall specimen. But I like the story and intrigue behind King Farouk's coins, because I've handled a couple items from King Farouk, and one day, I'll put one of the items, and the story about it on this blog. As with any of these items, there is always a fantastic story behind them. The owners of the 1913 Nickels include Warren Buffett and the Walmart family, and Jerry Buss of the Lakers. The one that sold yesterday was featured in Hawaii-Five-O in a 1973 episode called The $100,000 Nickel. There are five known specimens. But one is missing. One coin collector who was lucky enough to own a 1913 Liberty Nickel specimen for awhile was George O. Walton. On March 9, 1962, Walton was on his way to a coin show in his automobile. He had told the coin show promoters that he was bringing his 1913 Liberty Head Nickel with him so they could display it at the show. Unfortunately, Walton never made it, having lost his life in a car crash while en route. Although authorities found thousands of dollars worth of coins at the scene of the wreck, the 1913 Liberty Head Nickel was missing. There was much speculation about the whereabouts of the coin. Some people were certain that someone had stolen it, while others felt it had been lost at the scene. Apparently Walton's heirs never clarified matters. They had found a 1913 Liberty Head Nickel in Walton's effects at home following his death, and taken it to a leading numismatic firm for authentication. The experts at this firm condemned the coin as a fake (stating that it was a genuine coin which had been altered.) Following this news, the Walton heirs kept quiet about things and for forty years, nobody knew what had ever happened to the Walton specimen. 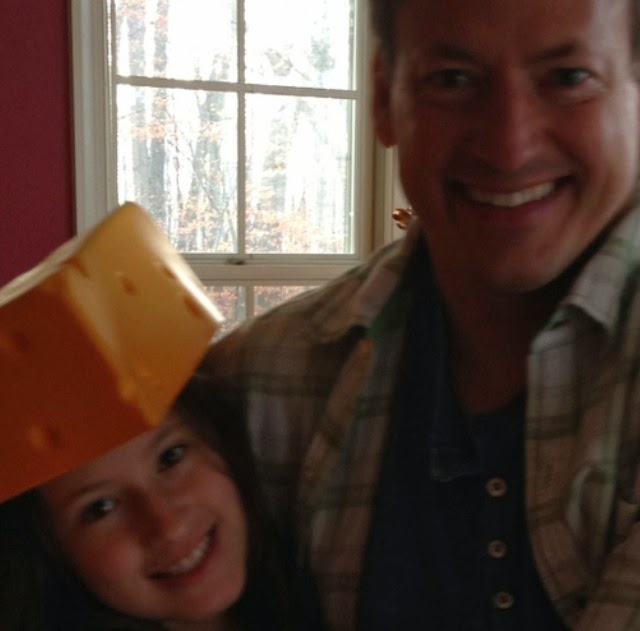 It was presumed lost. In July of 2003, the American Numismatic Association (ANA) organized a reunion of sorts for the four remaining known specimens of the 1913 Liberty Nickel. In conjunction with their annual World's Fair of Money, they made arrangements to exhibit all four 1913 Nickels. To add interest to the event, they offered a cash reward of thousands of dollars to anybody who could lead them to the lost fifth specimen. Bowers and Merena joined the fun, guaranteeing a $1 million sale price if whoever had the coin would put it up for auction. By this time, the Walton heirs had seen many photos of the other genuine 1913 Liberty Nickels, thanks to the Internet. Careful comparisons had been made, and they became convinced that their coin was worth another look, perhaps by a different expert. Imagine the stunned surprise when a Walton family member showed up at that 2003 World's Fair of Money to have their specimen examined! At least six different world-class experts examined the Walton coin, and they unanimously agreed that the coin was genuine! The lost 1913 Liberty Nickel had been found! Or had it....? Did Walton Have the Sixth Specimen With Him in 1962? Although the Walton heirs declined the $1 million offer, electing to retain the coin (which they still have to this day, as far as anybody knows,) the question still remains unanswered: Why would George Walton tell the coin show organizers in 1962 that he was bringing his specimen with him, only to leave it behind at home? Is there a sixth coin, lost on a roadside somewhere, flung from the vehicle upon impact? Or did someone at the scene of the accident take possession of the coin (and perhaps a few others) only to learn that the thing was so famous, they had no real hope of disposing of it profitably, and so there it sits, in some shoebox or jar somewhere, awaiting a future destiny? The Eliasberg Specimen, PCGS and NGC PR-66, once owned by Louis Eliasberg. The Walton Specimen, officially ungraded but authenticated in 2003 by several experts, held by George O. Walton's heirs. The Norweb Specimen, named for previous owner Henry Norweb, is officially ungraded and in the permanent collection of the Smithsonian Institution. The McDermott Specimen, NGC PR-55, named for former owner (and vest-pocket coin dealer) J.V. McDermott, is currently in the ANA World of Money Collection. The story behind the 1913 nickel is just as intriguing, along with the buyers. One of the owners of this coin, Colonel EHR Green was the son of the "Witch of Wall Street," Hetty Green, who at one time, was known as the richest woman in the world. Samuel W. Brown is considered the mastermind behind the 1913 Liberty Head nickels. Brown was employed at the Philadelphia Mint from December 1903 through November 1913, putting him at the right place and time. He was also the first person to make any reference to the possible existence of such coins, in the form of a small advertisement in the December 1919 issue of The Numismatist to purchase examples. Further, Brown was the first person to publicly share any of the coins in the form of a coin convention exhibit, just a few months later. Although circumstantial, the evidence points a finger directly at Sam Brown, likely with the assistance of one or more accomplices. Brown worked as a clerk or storekeeper, according to his employment transcript, resigning to enter business for his own account. He was born in Brownstown, Pennsylvania, circa 1879, and died in North Tonawanda, New York, in June 1944. It seems that Brown was always well liked and respected. After resigning from the Mint, he relocated to North Tonawanda late in 1913, where he was associated with Wayne Fahnestock in the Frontier Chocolate Company. He was later associated with the Pierce-Brown Company and retired in 1924 at the age of 45. He was a Mason and a past master of Sutherland Lodge No. 826. Brown also served as district deputy grandmaster of the Niagara Orleans district and as a member of the Shrine club and the Ismailia temple. Serving several terms on the Board of Education, he was mayor of North Tonawanda in 1932 and 1933. Ray Knight comments: "The mysterious Mr. Brown confounds understanding. Just when you think you have him pegged as a crafty, scheming thief, he conducts the rest of his life in what appears to be a completely exemplary manner." The authors of Million Dollar Nickels observe: "The whole affair of the 1913 Liberty nickels would possibly never have come up--and the coins may never have been created--had it not been for The Hobbs Episode." Treasury Secretary Franklin MacVeagh had an opportunity to make a permanent mark on the U.S. coinage before his term expired in 1913. The nickel was the only coin whose design could be changed under the 25-year law that states coin designs must remain in production for 25 years before they can be changed. MacVeagh served as Secretary of the Treasury from March 8, 1909, to March 5, 1913. After seeing James Earle Fraser's designs for the Buffalo nickel, he awarded Fraser the commission. In his annual report, Mint Director George Roberts stated about the Buffalo design: "The coin is distinctively characteristic of America, and in its execution promises to take high artistic rank among the coinages of the world." Everything was coming along smoothly, and the Buffalo nickel was about to become a reality--until the Hobbs episode began. Hobbs Manufacturing Company began business as a manufacturer of paper box machinery, originally in Lynn and Boston, relocating to Worcester, Massachusetts, in 1891. In 1910 the firm began production of vending machines for postage stamps, railroad ticket sales, and change-making. Officials from Hobbs Manufacturing found the new Indian/Buffalo nickel entirely unsatisfactory, demanding change after change to the Fraser design. Fraser sent a set of Hobbs-approved models to Charles Barber, who received them on December 26, 1912. He went to work reducing them and preparing dies, with test strikes minted on January 7, 1913. Hobbs was still unsatisfied and demanded more changes. Another six weeks of meetings and changes took place until MacVeagh had had enough. He certainly wanted the Buffalo nickel released before his term expired, and a meeting with Hobbs representatives on February 15, 1913, put an end to the episode. MacVeagh advised Roberts to proceed with production of the new nickels, and production finally commenced on February 21. All of the delays provided an opportunity for a special coinage. Much of what we know or think we know about the 1913 Liberty Head nickel remains undocumented. It seems that factual accuracy has never been a concern of numismatists in the past. John Dannreuther sums up the problem: "Once a rumor is repeated and put into print, it becomes fact. When one person repeats it and the next guy repeats it and the next guy repeats it, it becomes absolute fact. Then it becomes part of numismatic lore." Fortunately, the approach of 21st century numismatic research is a fresh look at past lore and legends. Instead of assuming that a story is correct, current research is verifying the source material and eliminating the speculation. There has been considerable discussion about how and when the 1913 Liberty nickels were made. The coins made their first public appearance in 1920, in the possession of Samuel W. Brown. Circumstantial evidence points to Brown, although it is unlikely that he actually struck the five coins himself. He was a clerk or storekeeper at the Mint, rather than a coiner or someone with knowledge of coin production. Brown almost certainly had one or more accomplices, but who were they? In Million Dollar Nickels, the authors devote an entire chapter, "Covert Origins," to the mystery of their production. The truth may never be known, as the facts are most likely buried with those responsible. 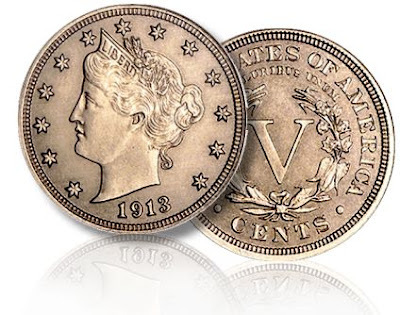 Some have speculated that the coins were made late in 1912, while others suggest early 1913, and some have even said that they could have been made as late as 1919, although the latter is highly improbable. 1. They were struck to exchange for coins needed for the Mint cabinet. 2. The coiner and engraver were merely amusing themselves when they struck the coins. 3. They were struck exclusively for a wealthy collector.